Earlier this week, the news broke of a manure spill in Allegan County, Michigan – about an hour and a half north of where I live. The spill originated at a dairy farm and was discovered last Friday – although they were unable to determine when the leak had started and how much manure had seeped into Bear Creek, which runs into a tributary of the Kalamazoo River and ultimately empties into Lake Michigan. They’ve estimated that the plume has travelled about five miles downstream at this point. I was actually sitting in the newsroom at my workplace (I work for a radio broadcasting company) when my coworker announced the manure spill. Offhandedly, I cringed and said, “That’s why I don’t eat meat!” He looked at me like I was crazy – what does that have to do with a manure spill?? My coworker didn’t immediately make the connection between my choice to avoid meat and the manure spill that took place last week. He tried to defend the industry by countering that we need manure. “But you’re a vegetarian! It fertilizes our crops. Our vegetables!” he said. I tried to explain that the amount of manure we produce (not to mention the poor-quality, hormone-laden, disease-ridden manure we produce) is totally unnecessary for growing vegetables. The EPA has estimated that a farm with 2,500 cows on it can generate as much waste as the people in a city the size of Miami. That’s a lot of poop. 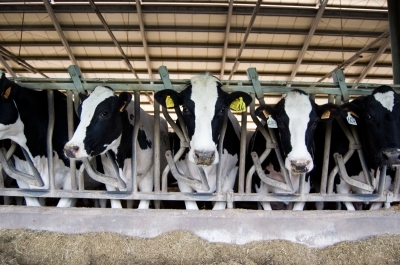 Last year, the Center for a Livable Future at Johns Hopkins Bloomberg School of Public Health performed a 5-year follow-up to the 2008 report, Putting Meat on the Table: Industrial Farm Animal Production in America (published by the Pew Charitable Trusts). The general findings of the original report concluded that industrial animal production as it is performed today (2008) is unsustainable. “It represents an unacceptable level of threat to public health, an unacceptable level of damage to the environment, is harmful to the animals housed in the most restrictive confinement systems, and is harmful to the long-term economic health to the communities near their location” (Robert Martin, Food System Policy Director at the Center for a Livable Future and former Executive Director of the commission formed for the 2008 study). The follow-up study reported that all of the original problems outlined in the 2008 publication have only gotten worse. More concentrated animal production. Greater antibiotic resistance. And yes, the public health threat from livestock waste has grown. In a statement released by John Schaendorf, the farm owner responsible for the spill, he said, “It’s new for everybody. It’s never happened before.” Except that it has, and it certainly could again, in my state and elsewhere. And the scary part about animal waste is that unlike human waste, which undergoes treatment by law, animal waste is not regulated at all. Instead, it’s held in giant manure lagoons before being diluted and spread over cropland. It takes nothing more than a large storm to sweep through and overflow these manure pits – leeching hormones, pathogens and toxic metals into the nearby water table. As it happens, that’s exactly what occurred in Allegan County; the spill is now being blamed on an icy, snow-covered “pipe and valve that failed in a storm water system”. With all the rain and snow melt Southwest Michigan has received in the last two days (and the warnings of flash flooding), that means that whatever cleanup is left will be virtually impossible. This is why it’s so important that we make those connections – between the supply and demand of our diets, and the health of our immediate environment. They are intricately linked to the very health of our own families and neighbors. And as we are pounded with more and more extreme weather each year, spills of this type are bound to happen again. This entry was posted in Uncategorized and tagged Allegan County, CAFO, cows, dairy, manure, manure spill, Michigan by kathleendayle. Bookmark the permalink.